Decorating your home in a different style or era can drastically transform it from dull and dreary to intriguing and unique. Not only that, but altering your interior décor will impart a fresh ambience, and can instil a sense of originally, as well as personality. 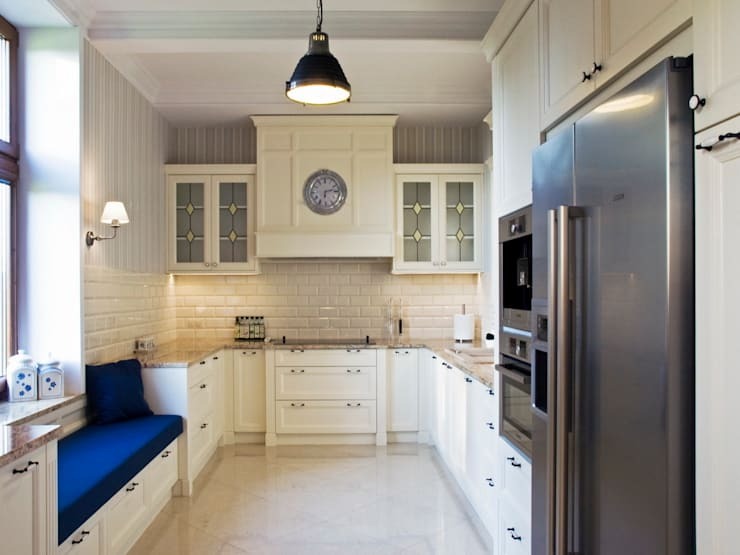 Today on homify we are taking a look at antique styled interiors. Domestic spaces that have imparted a little history and heritage to create character, charm and charisma. If you are looking to enhance your home with vintage vibes or antique style, then you have come to the right place. The key to ensuring your newly renovated or redecorated interior looks the part is to choose an era and stick to it! Whether you like French provincial antiques, or eclectic Indian style, continuity is the key to success. If you would like a few handy hints and exciting examples, we have collated some of our favourites below. Check out the images, and refresh your dwelling with confidence and sophistication. First off, we are going to take a look at the study space. A study can be an excellent area to begin your antique styling and design, as it requires few pieces of furniture, and therefore will take less time and potentially cost a little less money. By decorating your study first, you will get a good idea about the general vintage aesthetic you intend to impart, and can play around with styles. Here we see a truly gorgeous and charismatic home office. The space is full of character, and works beautifully to create a room of charm and comfort. Essentially, the antique table and chair take centre stage, but it is the other elements that really bring it together. 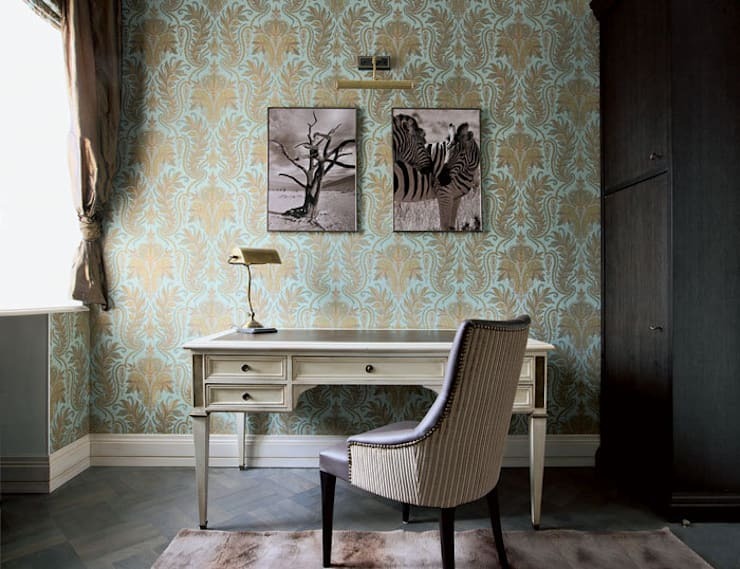 The bankers' lamp and wallpaper are gorgeously coordinated within the space, and add that antique aesthetic with ease. Final touches include the heavy drapes, and artwork upon the walls, Consider a wall mounted light to illuminate artwork, or simply a side table lamp to impart soft and warm illumination. The living room is often the first place people start when they want to begin their antique styled home. However, the living room contains so many different elements, it can be difficult knowing which parts to give the most attention. Between sofas, armchairs, artwork, curios, ornamentation, console table, entertainment units, and lighting, the living room is a veritable playground of different features and elements. As totally redecorating your living room can be expensive, we recommend starting with a statement armchair. An antique armchair is an investment, and will look great in almost any setting. Within the image above, we see a gorgeous tanned leather armchair in a bright rust/orange hue. This antique styled piece is a great illustration of a seat that would look great in a contemporary setting, but will really get your antique design skills in full swing. 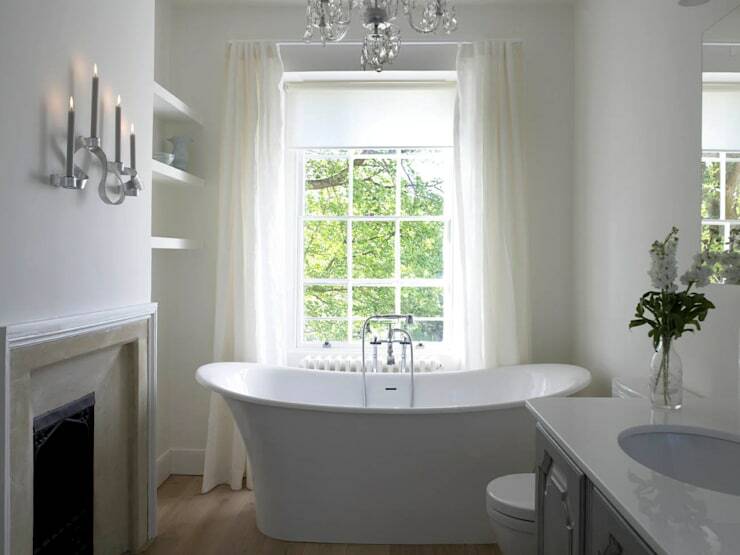 Vintage bathtubs are currently enjoying a huge resurgence in popularity. Not only do they add style, and a little class, but they are brilliant for creating an antique styled abode. A plethora of different antique style tubs currently exist on the market, so deciding which one to purchase is most-likely going to be your biggest problem. Here in this example we see a simple freestanding white ceramic style tub. This is a common choice, and looks effortlessly charming within the room. This style of bathtub is a good choice for those who wish to have a modern fixture, but still would like a little of the antique style. If you want to go the entire way and choose something totally authentic, consider a copper bath, or a clawfoot freestanding tub. Pair with other accessories such as a chandelier, for that truly vintage vibe. Within the kitchen there are numerous inclusions that can ensure your home features an antique style and design. First, and the most obvious option, is the joinery. Joinery can be changed without re-furnishing the entire cooking space, and if you already have built-in cupboards, you may want to simply change the doors. Chat to a professional to get the design and fit that you require. Within this example we see a number of antique style features that would look perfect in creating your old world character and charm. The standout items are the stained glass cupboard doors, which work wonderfully in adding a sense of history and heritage to the space. 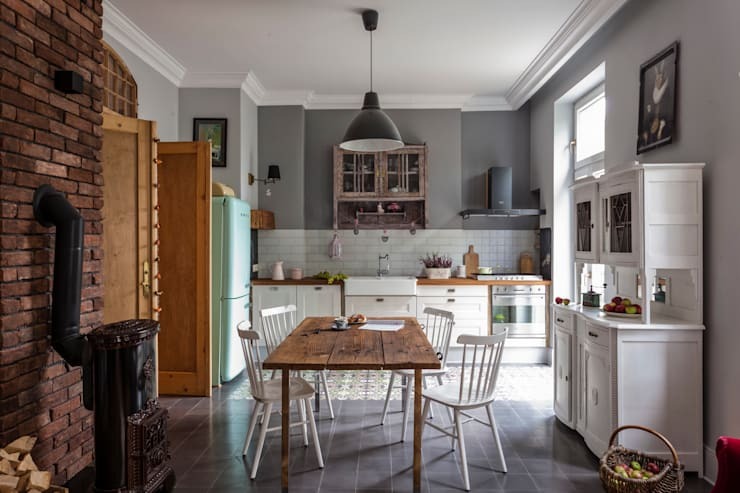 This kitchen retains its contemporary appliances, and these juxtapose brilliantly with the cream joinery, and striped wallpaper. Antique styled bedrooms can really transform a home. If you need somewhere to seek refuge from the bustling and frenetic city, you simply need a gorgeous vintage bedroom. Here in this image we see an adorable bed-head that would make an easy DIY project for the holidays. Not only does it add a vintage aesthetic, but it imparts a sumptuous and welcoming ambience. 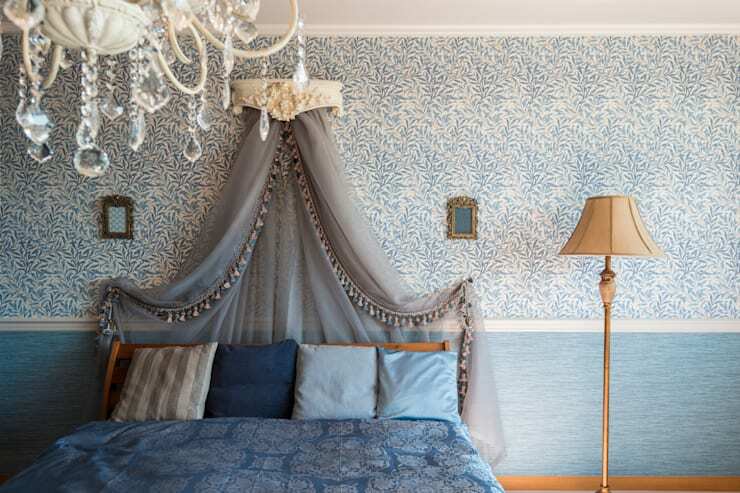 Pair this bed with wallpaper, a chandelier, and a simple freestanding floor lamp for a room that is simply delightful. Last, but certainly not least we come to the dining space. Dining rooms within kitchens can save you space, and provide a stylish area to prepare food, as well as eat dinner. In order to impart a little antique style within your space, avoid a new or contemporary table, and instead opt for a sophisticated or rustic/vintage piece. Within this room we see a range of gorgeous and characterful items. The wood burner in the corner is an attractive addition, but could be replaced with a sideboard, as the heat is not normally necessary. The centre of the room is where the table really shines. It is simple in its design and form, and lends itself to inclusion within a modern dwelling, as well as an antique styled abode. Paired with white chairs, this room is perfectly vintage and rustic.